On March 19 and 20, Presiding Judge Peggy Chiampas found eleven activists not guilty of all misdemeanor charges. The two unrelated cases involved members of Action Now and the Immigrant Youth Justice League engaging in courageous demonstration activity to improve their communities and promote social justice. The demonstrators were represented by People’s Law Office attorneys Janine Hoft and Sarah Gelsomino. On Monday, five women ranging in age from 56-81 appeared in Branch 46 at its new location at 26th and California, Room 102, answering ready for a jury trial. They were charged with criminal trespass to the downtown headquarters of Bank of America for refusing to leave the bank after presenting a display of dangerous items on the front windowsill. The items, including drug paraphanelia, prophylactics and liquor bottles were picked up that morning by the women who participated in cleaning up an unsecured, vacant residential property subjected to foreclosure by Bank of America. 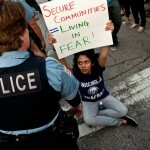 The women were prepared to testify that Bank of America’s failure to take responsibility for cleaning or securing the property, which was located within blocks of two schools, created an emergency situation demanding their necessary actions. A researcher was also prepared to testify that thousands of such properties exist in the Chicago area, ignored by Bank of America despite many efforts to hold them accountable, including passing a city ordinance specifically requiring the bank’s action. Despite Judge Chiampas’ statements that she found the police and bank security personnel to be credible witnesses, she granted defendants’ motion for a directed finding after the State’s case and found all five women not guilty of criminal trespass. The following day, six youth ranging in age from 18-24, appeared for their sixth court appearance at Branch 46 in front of Judge Chiampas. The State and City persistently pursued the case despite seeking continuances on three prior court appearance due to its failure to be prepared for trial. Each of the youth were charged with obstruction of traffic by the City along with reckless conduct and mob action by the State. 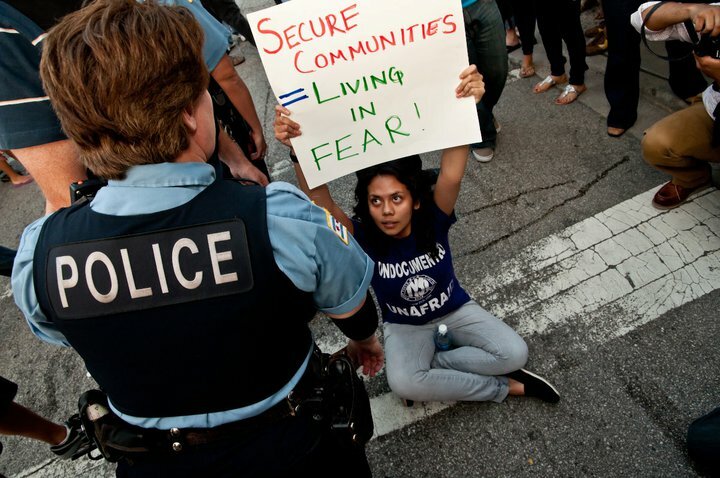 These six young people participated in an action on August 17, 2011, to expose and denounce the so-called “Secure Communities” policies requiring US Immigration and Custom Enforcement Agency to be notified when anyone comes in contact with law enforcement. Fred Tsao, policy director at the Illinois Coalition for Immigrant and Refugee Rights, was prepared to testify that these policies promote racial profiling, diminish trust between immigrant communities and law enforcement and have caused thousands to be taken into immigration custody despite almost half of those individuals having never been charged with or convicted of, the crimes for which they were arrested. Each of the six youth was prepared to testify in a persuasive and passionate fashion that they were brought to this country as children, were long time undocumented residents of the Chicago area and felt constantly threatened that they or their loved ones may be deported at any moment. Each made a courageous decision to risk becoming the real people who “Secure Communities” would seek to deport from this country by being arrested. Each sincerely believed that their actions were necessary to expose our irrational, hurtful immigration policies and to “come out of the shadows” to put a face to a prejudicial, sinister and false stereotype of those living in this country without legal documents and stop themselves from living in constant dread and fear. After hearing from a single police officer which comprised the entirety of the prosecution’s case, Judge Chiampas granted defendants’ motion for a directed finding and found each youth not guilty of all charges brought against them by the City and the State. Judge Chiampas in her decision referenced her own status as the child of immigrant parents of Greek descent and that she agreed with Attorney Hoft’s statement in her opening that the six defendants represented the “best of American youth” in that they were educated, involved, politically engaged and participating in a movement for positive social change in the finest traditions of our country. This entry was posted in featured-news, news by Janine Hoft. Bookmark the permalink.